Six electronically rooted, liquid tracks from six fine producers. E.I.E. E.P.1.1. features new tracks from: Alphabets Heaven, Atomico, Electric Ape, Inwards, Proprio & Scaramanga Silk. The first in a new series from Kin-Aesthetic Recordings, exploring atmospheric electronics; six electronically rooted, liquid tracks from six fine producers: Alphabets Heaven, Atomico, Electric Ape, Inwards, Proprio and Scaramanga Silk. Opening with the uneasy heart-beating toll of Theme from The Infernal Machine, rising up with an inescapable stomp-march, its gloriously cold analogue bite might soundtrack a Zombi attack on the outskirts of Detroit. Tentatively, Limbic System follows. Rebalancing to ambient calm with half-glanced shimmers and softly pulsing neuro-transmissions, the atmosphere breathes and lulls hypnotically, clicking, popping and geiger-counter ticking from within. The intensity is ratcheted up with Amin, a quick-witted liquid beat that modulates, shifts and snaps, with a knowing nod, yet a fresh tenacity. Spacious, sharp, percussive; this circling groove deserves a jittering dancefloor. Re-doubling the energetic leap with this almost-lost production from 99', the taut electronic funk-beat of Forever brings an otherworldly depth, ghostly atmospherics and hot-footed drums serenade the divine closing quarter' molten synth-line. Condensing into electrically charged cloud cover, the tropical ambience of Velvet Raindrops weighs heavy. The sultry electronic climate swells and swirls, threatening to explode, still the rich humidity reigns supreme. Finally, we stumble into the drowsy, drunken, distorted synth-groove of Columbo. Off-balance, world-worn, the excavated crooked beat rocks back and forth, strewn with end-of-night murmurs, yet crucially breaking into thumping coherence. 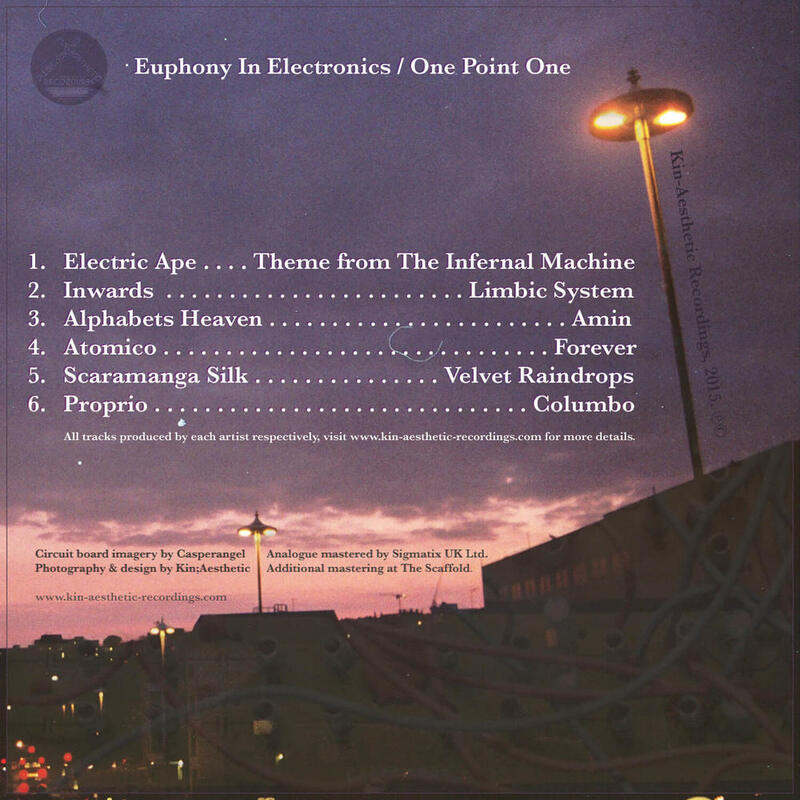 E.I.E.1.1 received support from National, International and Specialist shows including BBC Radio 3's Late Junction courtesy of Nick Luscombe & Verity Sharp, BBC6 Music courtesy of Gideon Coe, Pilote via Train 45, Lost Idol on Morning Glory, Chris Wave on Seventh Wave, Spirit Of Gravity on Resonance Extra and on rotation via Danish curated radio station, The Lake.